Long, long, long ago, Bella and her grandmother Mamá Alma admired their vegetable garden. They liked gardening together. They grew sunflowers and lilies too, and chatted with lizards and hummingbirds. They walked around the flowers and vegetables holding hands, something they had done frequently since Bella was a baby. As her grandmother aged, Bella helped her to walk. “Every year, I need your help more and more,” said Mamá Alma. 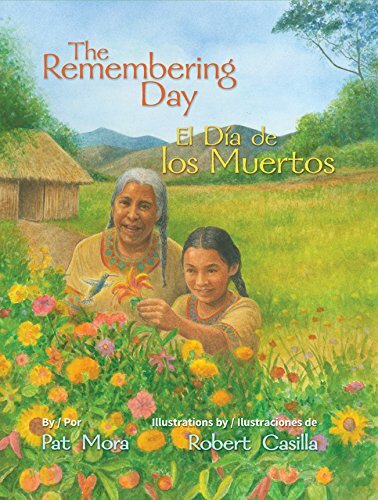 In this special bilingual picture book for children, author Pat Mora creates an origin myth in which she imagines how the Mexican custom of remembering deceased loved ones—El día de los muertos or the Day of the Dead—came to be. With tender illustrations by Robert Casilla that depict Bella and Mamá Alma’s loving relationship, this book will encourage children to honor loved ones, whether by writing stories and poems or creating their own remembering place.